All that personalization has come at a price, however. With everyone cocooned inside their own playlists and cut off from the outside world by earbuds, the communal experience of listening to recorded music with friends or family has become a rarity. “In the digital era, [group listening is] one of the things that’s been lost,” Amazon’s VP of music Steve Boom, told the Wall Street Journal this week. In designing its new, three-tiered Music Unlimited service, Boom said, Amazon set out to try to restore some semblance of the experience of listening to vinyl albums in a group and reading liner notes. The new service is tightly tied to Amazon’s voice-activated Echo speakers, which are powered by its digital assistant, Alexa. Users can ask Alexa to play a commentary by an artists as a playlist of that artist’s songs is being streamed, while lyrics scroll across the screens of other devices. Music Unlimited’s music discovery process also relies heavily on crowd-sourcing, as well as personal usage data. Users will be able to ask Alexa to “play the new Green Day song” without knowing the title and have it start playing instantly. But Alexa is also smart enough to know what the user means even if the user doesn’t. The reliance on voice activation is also meant to coax music off the phone. Amazon’s strategy for Music Unlimited isn’t driven only by its desired to make listening to recorded music more social, of course. The Echo speaker is fundamentally an in-home access device intended to eliminate friction from the process of ordering more stuff from Amazon. So in that sense, the new streaming service is something of a Trojan horse, designed to get more Echos into homes. But there’s other evidence that consumers are yearning for a more socially immersive experience around music than they can get from their smartphones. 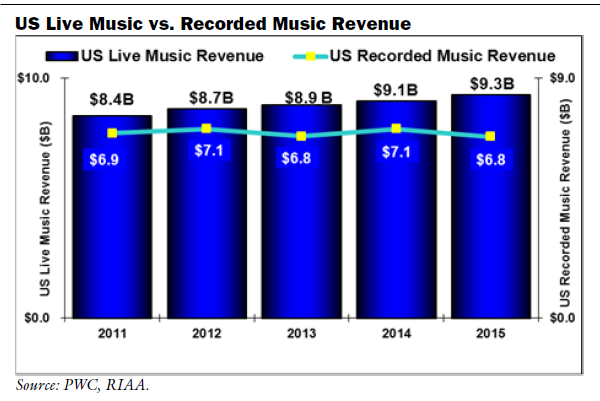 In a provocative report released last week by Needham Insights, analyst Laura Martin argues that the real impact of streaming has not been in the market for recorded music, where industry revenue in the U.S. has been essentially flat since 2010, at roughly $6.8 billion. Instead, increased streaming is driving overall demand for music, most of which is being captured by live performance revenue, which has grown by 11 percent over that same period, to $9.3 billion. Ticket revenue has grown 10 percent over the past five years, to $7.2 billion, while sponsorship fees have accounted for a steady 22 percent of total revenue from live events, reaching $2.1 billion in 2015. From industry macro perspective, moreover, Martin argues, live events are the better end of the business to be in at this point than recorded music. Not only is the recording side of the business not growing, as streaming accounts for an ever-greater share of recorded-music revenue the industry is becoming more dependent on the health of companies like Spotify, Pandora and Tidal that are yet to prove they can make a profit from streaming music. The live performance business, in contrast, is not only growing but promises significant near-term upside as technologies like RFID and cashless payments become more common. Amazon isn’t in the live event business, or course, and its new streaming service faces considerable competitive challenges. 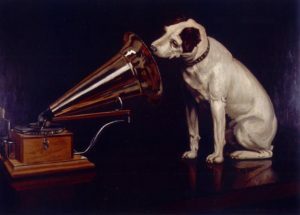 But the trends Martin highlights suggest that a strategy that emphasizes the social and communal aspects of listening to music could uncover value that a personal playlists misses.